Did you know that a wealth of information is just a click away on the NCS website header? The header has rotating message topics. Message topics are NCS Vision and Mission Statement, About NC Swimming, USA Swimming, Meet Schedule, Join a Club, Become a Coach, and Become an Official. By tapping the topic title you will be linked to a web page with information on that topic. You can either wait for the topic to appear or click the little red dots to take you to your topic of choice. Bonus Tip: Clicking this image on the header bar will always take you back to the home page. The camp will be held from May 2-5, 2019 at the Olympic Training Center in Colorado Springs, CO. The purpose of this camp is to instill a vision of success and inspire athletes from ethnically under-represented populations to become leaders in the sport of swimming. For more information and selection criteria click here. Both the athlete & assistant coach applications will be open until February 8, 2019 and are available here. 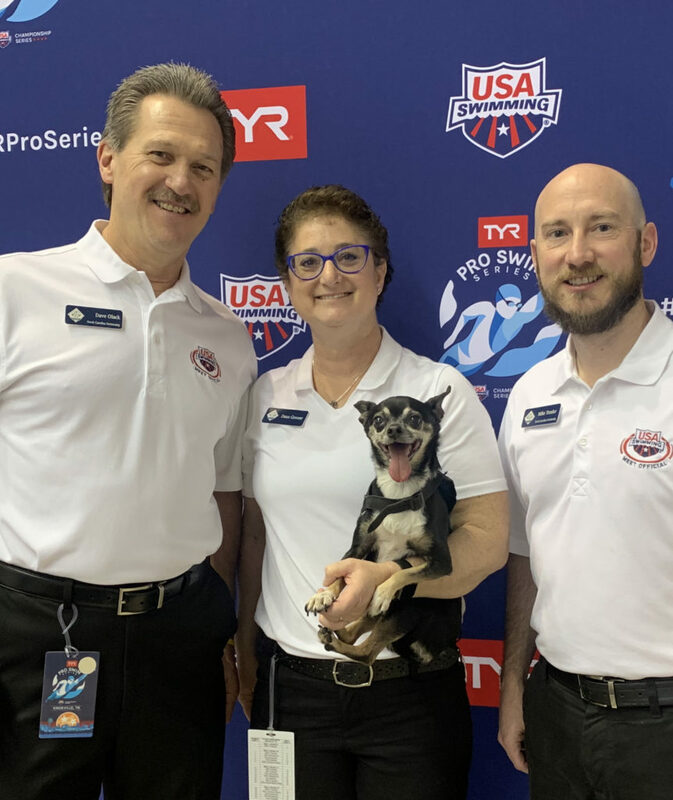 NCS officials were on deck for the Knoxville TYR Pro Series Meet last weekend. Pictured from left to right are Dave Olack, Dana Greene, and Mike Trexler. 2019 will be a transition year on the officials deck uniform. The meets associated with U.S. Paralympics swimming will now consist of a White Polo Shirt, Black pants/skirts and black shoes and socks. If a belt is worn with the pants/skirt, then that should also be black. For meets below the National level , 2019 will be a transition year and officials will be given the choice to wear Navy Blue or Black bottoms as these appear similar from a distance and, depending on their LSC uniform, some officials may have purchased this color specifically for U.S. Paralympics Swimming meets, but the shoes and socks will change to black immediately. For the National Championship and World Series meets hosted in the U.S., the black bottoms and shoes uniform is effective immediately. When we introduced the ROC’s in 2016 to provide a more regional focal point and facilitate communication with the officials, we envisaged that nominations would be called for each November with elections and appointments following in December. As our existing ROC’s (Doug Griswold – Eastern, Char Sorensen – Western, Susan Mechler – Central and Glenda Orth – Southern) assumed their roles and help define the expectations and the requirements for these positions, it became obvious that the original premises could be improved upon. Moving forward the ROC nomination, election and appointments will now be made every odd year and the appointment will be for a two year term. This will give the officials appointed time to settle into the role as they fulfill their requirements without having a steep learning curve repeated every year. If you are wishing to obtain/renew your certifications, the application for the course will be included on the Application to Officiate on the web for each of these competitions. If you know of anyone interested in attending this course, please pass this information on to them. Applications are being accepted for the fifth annual 2019 Carolina Crown Swim Challenge to be held at the Mecklenburg County Aquatic Center on the afternoon of April 27, 2019 in conjunction with Swimposium Carolina 2019. The meet features top 15-18-year-old athletes from both North Carolina and South Carolina who are divided into four teams. Each team has four coaches. 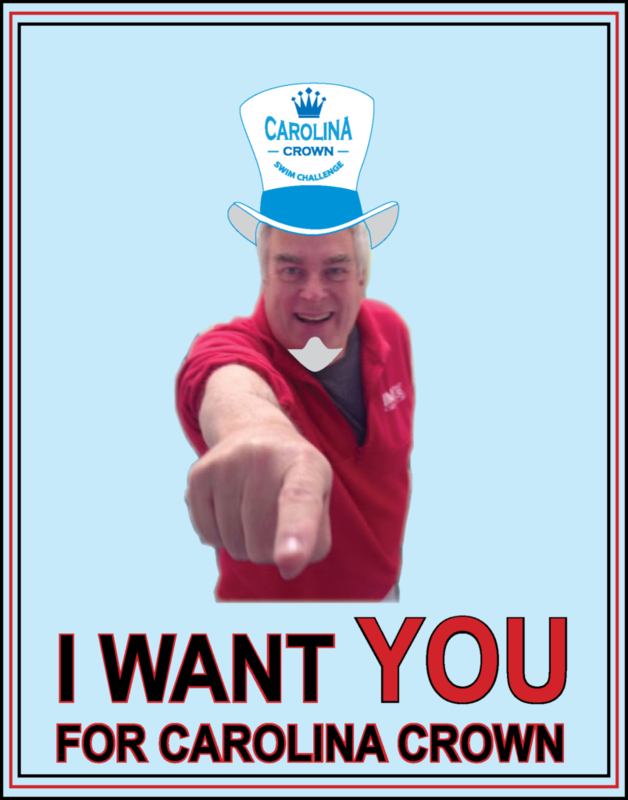 We are looking for six coaches from North Carolina and six coaches from South Carolina. If you would like to join in the fun, please submit the following application form as soon as possible, but no later than March 31, 2019. Here is the initial 2019 NC Open Water Zone Team. The meet will be held On April 13th and 14th in Ft Myers, Fl. This year it will be swum at Florida Gulf Coast University, in a lake. The team will fly down on April 12th and return on April 14th. This year, the zone was asked to use the FINA standard for the Age Up, which is the end of the year (12/31/2019). So, there are some swimmers who would have made the team that are now in the older age group. This is not something that NC Swimming asked for, but was asked for by USA Swimming, to make it easier for them for qualification purposes to Open Water Junior Nationals and Open Water Nationals. 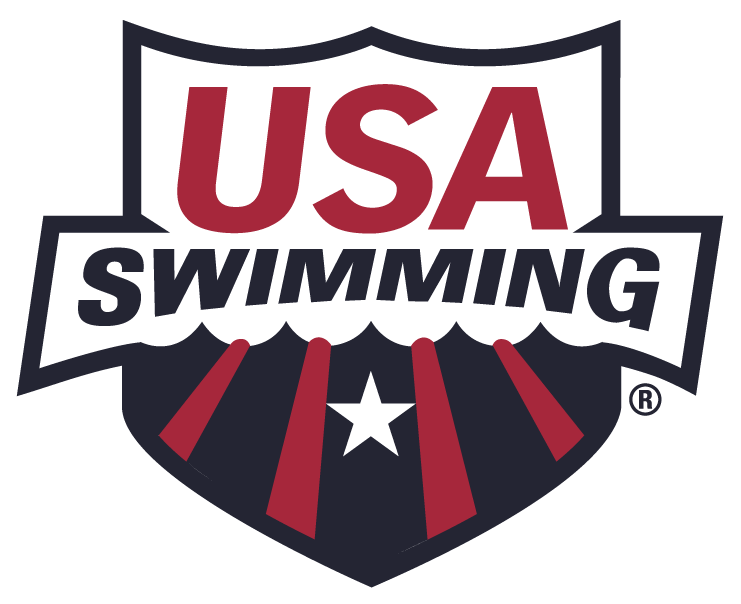 We realize that at the meet in September, swimmers were told it was their age as of April 13th, however, we were not told by USA Swimming until after our meet. I will answer emails about the meet itself, but I will NOT respond to any emails regarding the date being to determine the age of the swimmer at the meet. This was not my decision. 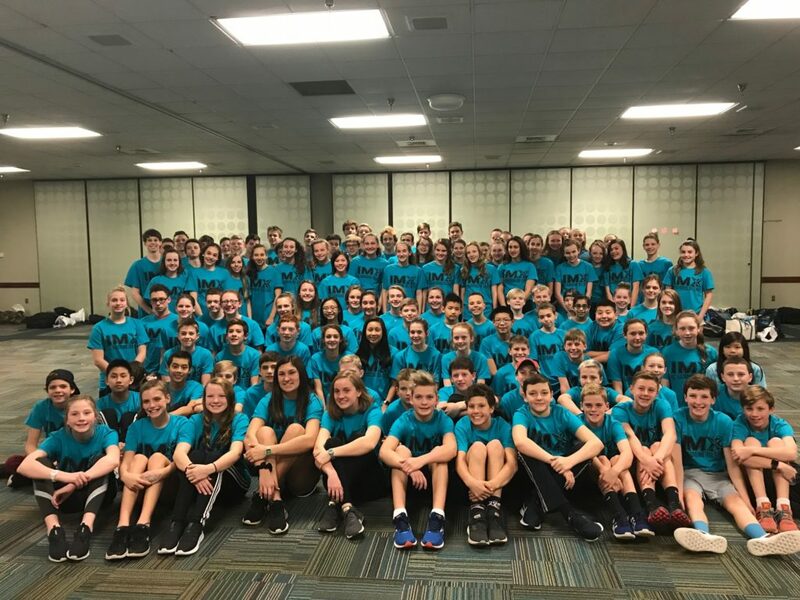 Thank you to IMX Camp head coach Amy Faulk for creating a video with highlights of the 2019 NCS IMX Camp at the Greensboro Aquatic Center. Also thanks to camp director Jay Dodson, camps coordinator Jonathan Watson, and the rest of the IMX camp coaching staff for providing this opportunity for NCS swimmers. Click the following link or the IMX camp photo above to view the video. 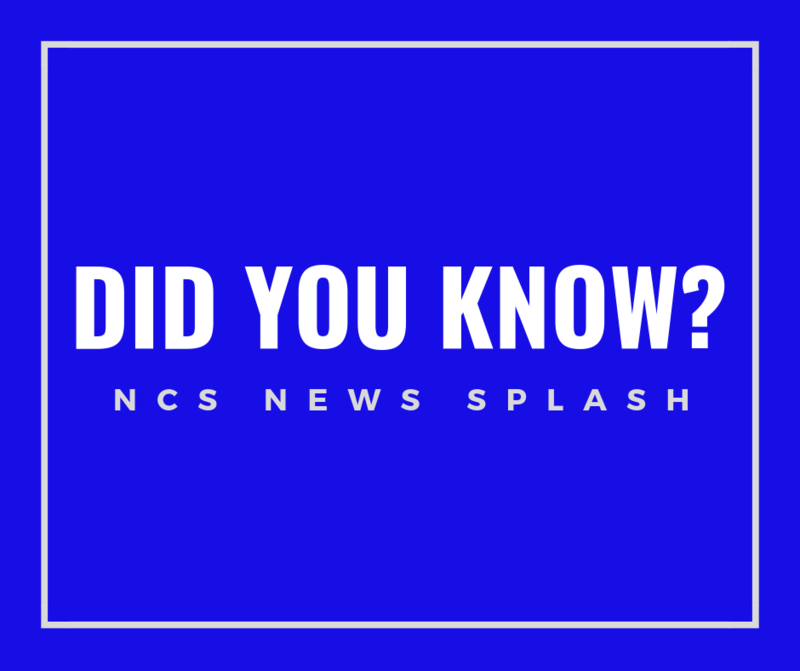 Did you know that if you are looking for information on the NCS website there is a search bar to assist you. Simply type in a key word or phrase and any previous posts with that word or phrase will appear. It is a great time saver and a simple method of retrieving previously posted information. There is also a separate search bar in the MEETS section. This search bar can be found in the current meet schedule listings and in the meet archives listings. Using the search bar is the quickest and easiest method to pull up specific past or upcoming meets. Simply type in the year and the meet host club initials. For example, 2018 MOR will pull up all the meets that the Marlins of Raleigh hosted during 2018.